Mariners general manager Jerry Dipoto and others addressed the media Thursday at T-Mobile Park. Here's what we learned. 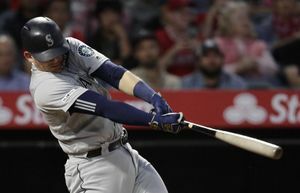 Even in the midst of a new organizational plan that features a “step back” in 2019 with a focus on 2020 and 2021, there was still a level of optimism at the building now known as T-Mobile Park on Thursday morning. 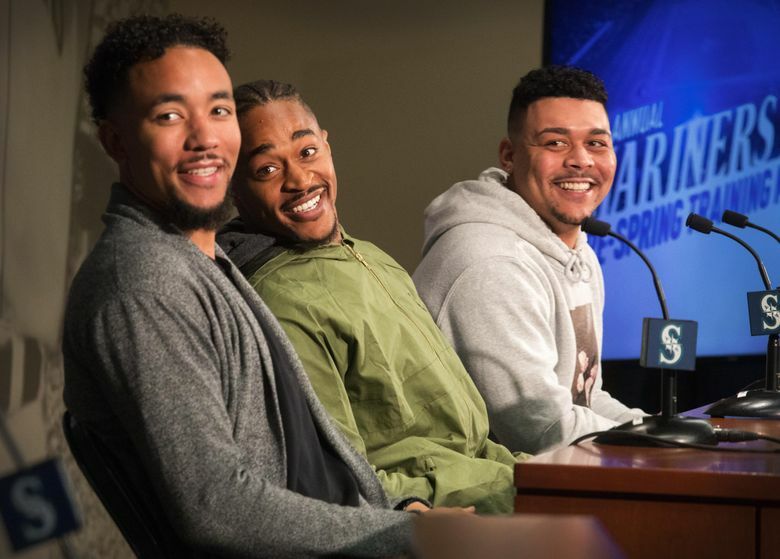 The Mariners held their 39th annual pre-spring training luncheon that featured general manager Jerry Dipoto, manager Scott Servais, director of player development Andy McKay and recently acquired players Mallex Smith, J.P. Crawford and Justus Sheffield talking to the local media. And while the team’s immediate future, specifically the 2019 season, doesn’t seem to trend toward snapping the longest postseason drought in all of the major sports in North America, there is a belief that the decision to begin this process is correct. Success may come in two years but there is a focus on still being competitive now. Dipoto was a bit more realistic about the team’s position, but also wouldn’t doom it to failure. 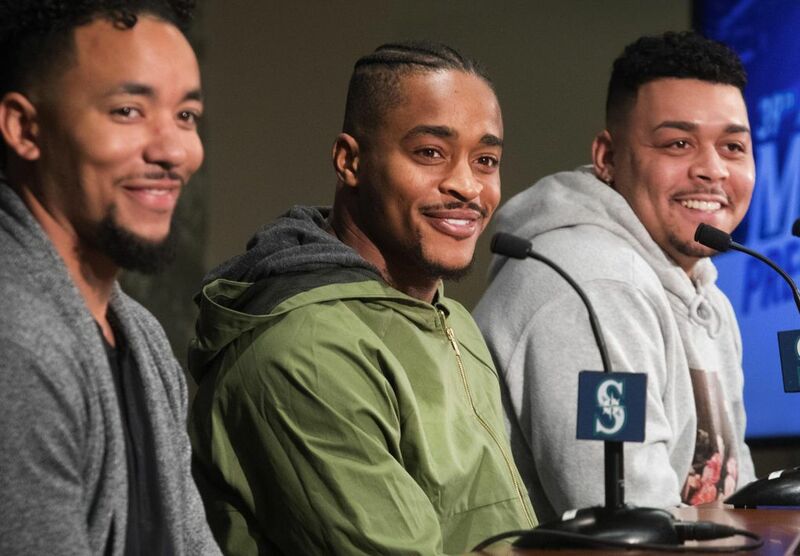 With a truncated spring training due to a trip to Japan and this new offseason plan put into place, the Mariners will have many of their top prospects to MLB spring training with some on the 40-man roster and others invited. Of their Top 30 prospects per MLB Pipeline, Sheffield, LHP (No. 1), Justin Dunn, RHP (No. 3), Kyle Lewis, OF (No. 4), Evan White, 1B (No. 5), Shed Long, 2B (No. 8), Braden Bishop, OF (No. 9), Erik Swanson, RHP (No. 11), Matt Festa, RHP (No. 12), Dom Thompson-Williams, OF (No. 16), Cal Raleigh, C (No. 18), Eric Filia, OF (No. 22), Jake Fraley, OF (No. 27) and Gerson Bautista, RHP (No. 28) will all be in camp. Servais is receptive to their presence in camp. Of the players coming into major league spring training, only two are not expected to be fully cleared for activity when they arrive. Relievers Anthony Swarzak and Sam Tuivailala will both be dealing with respective injuries when pitchers and catchers report to spring training on Feb. 11. Tuivailala wasn’t expected to be ready for the report date after undergoing season-ending surgery to repair a ruptured right Achilles tendon in mid-August. Acquired from the Cardinals at the trade deadline last season, the hard-throwing right-hander appeared in five games, posting a 1.69 ERA. He suffered the injury while chasing a base runner down in a rundown in Texas. Swarzak was acquired as part of the five-player return from the Mets in the trade that sent Edwin Diaz and Robinson Cano to New York. 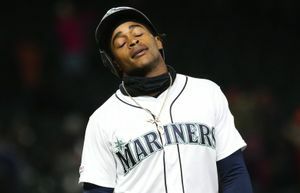 Given his experience, the veteran right-hander was expected to pitch in the back of the Mariners’ bullpen and possibly handle closing some games if needed. After starting a throwing program this offseason and even throwing off the mound, Swarzak felt some shoulder discomfort and the Mariners decided to exercise caution. Swarzak dealt with shoulder issues last season for the Mets. 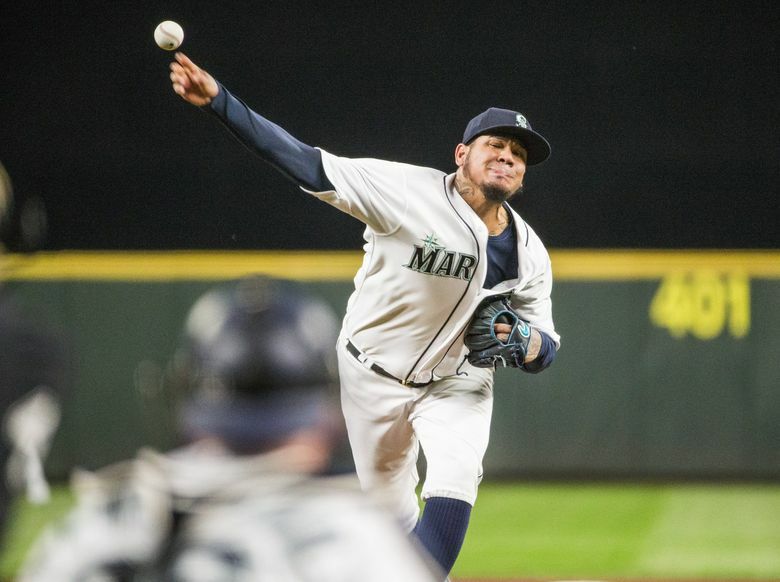 There was some groundswell among fans about the idea of converting Felix Hernandez to a reliever, possibly the team’s closer, in the final year of his contract. Hernandez was demoted to the bullpen last season and made one extended relief appearance — the first of his career. But an injury to James Paxton allowed Hernandez to quickly return to the rotation. As of now, he’ll be a member of the rotation along with Marco Gonzales, Mike Leake, Yusei Kikuchi and Wade LeBlanc. Hernandez posted an 8-14 record last season with a 5.55 ERA in 28 starts and one relief appearance. He’s owed $27.5 million this season. Some fans believed that the Mariners’ trident logo on their spring training/regular season batting practice hats was bad luck and a curse based on the myth of Poseidon. That will no longer be an issue this season. The team will debut a new spring training/batting practice hat with a different logo and a new jersey for this spring. 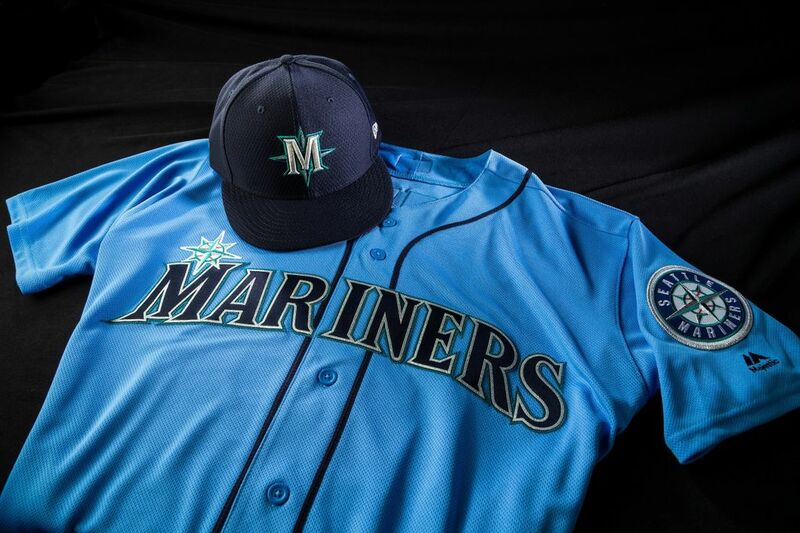 The cap will be all navy with a letter M superimposed over the Mariners’ nautical compass design. Of course, these new items are already on sale in Mariners team stores in the area. Edgar Martinez’s election into the Baseball Hall of Fame and his induction ceremony on July 21 is something the Mariners will celebrate for the entire 2019 season. They plan to open T-Mobile Park early on induction day to let fans watch the ceremony before the game later that day vs. the Angels. Following the celebration in Cooperstown, N.Y., the Mariners will hold an Edgar Martinez Hall of Fame celebration weekend in Seattle on August 9-11 at T-Mobile Park. The series will be against the Tampa Bay Rays and features three days of giveaways. Friday, August 9 — The first 40,000 fans through the gates will receive a bobblehead featuring Edgar holding a replica of his Hall of Fame plaque. Saturday, August 10 — A pregame ceremony in Edgar’s honor will start at 5:30 p.m. (6:10 p.m. first pitch). The first 40,000 fans will receive a replica of Edgar’s Hall of Fame plaque. Sunday, August 11 — The first 40,000 fans will receive Edgar Martinez Drive South replica street signs.